by The Solitary Writer on 7/04/2012 03:46:00 PM in fiction, murder, superstar, tamil. "Dada...can I call u by this name?," A little girl of 6 came running towards me as I entered my house. She resembled her mother. "Appa...meet Akhila your loving granddaughter," My daugher Hema introduced me to Akhila whom I was meeting for the first time ever since her birth. Having spent 14 long years in prison ,I have realized that life had been too harsh on me for I even failed to recognize my own kith and kin. "Yes dear...I am your dada. You never knew how delighted I am to see you and hold you my dear," I took her in my laps and kissed on her soft tender cheeks. She soon left for school and we never met until dinner. The night was still young yet everyone at home was fast asleep. I lolled on the couch near the window peeping outside admiring the scenic beauty and vastness of the night sky. It had been long since I sat like this in complete silence. Those were the days of fame when I was at my career peak. The house which I lived for 30 years failed to embrace me. All because of a fateful day. The day I got linked to a murder case. There was few minutes of silence as I lied on the couch introspecting where things went wrong . "Dadaaa..," My granddaughter sat next to me. "How was school today?," I gently asked her, ruffling her thick dark curls. "school isn't fun," She complained. "Where were you all these days dada?," I saw a glimpse of innocence reflecting in her shiny eyes as she uttered these words. "I was outside the town lovely," I said as she sat on my lap. "Why didn't you come to meet me even once?," She said, her eyes turned moist with tears. "Oh lovely ,don't cry...now that I'm back ..I promise I will be with your forever," I wiped the tears rolling on her cheeks with a napkin. "But you know..some of my friends mock me saying you were sentenced to jail," She said making a puppy face. "And you murdered someone ...," She continued. "Is it true?," She questioned me something I was well prepared to answer. "Oh dearie. Its time to sleep. you have to wake up early tomorrow ," I said to her. "No Dada..you are going to tell me else I will not talk to you ," She was visibly a defiant kid. All my attempts to refrain from this topic seemed futile. "Ok I will tell you..but before that you need to make a promise. I opened my palm to make the gesture. “promise me you will never ever say this to anyone," I asked her. "Ok ..I will not tell anyone.. not even Amma," She immediately held my hand and smiled. "You might be unaware that I was a reigning superstar of Tamil Cinema during the 80's and the 90's era. I had a huge fan following. People especially youngsters were crazy behind me and would perform religious rituals every time my movie released. That time I considered myself lucky for I had great people around me who appreciated and encouraged me with their constant support. They loved me and even put me next to their God," I smiled as the word made my nostalgic. Little Akhila’s gaze was fixed upon my eyes as I told her my story. I believed that she found it intriguing. "Wow..I'm sure you must be having many female fans as well," She laughed. "oh yes” I laughed at her question. “An ensemble of females gathered outside our house just outside that verandah whenever my new film released," I pointed my index finger towards the verandah. "They would come with garlands and flower bouquets to wish me and catch a glimpse of their hero," I continued. "I would address them from the balcony ,"
"Amazing! 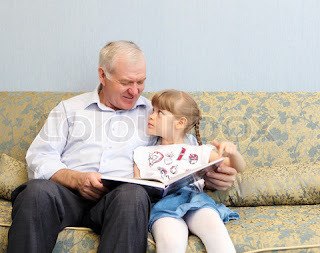 How lucky a person you were dada," She said as she reclined on the sofa resting her head upon my shoulder. "I met your grandmother at the set of 'Veera Paandi' where she was casted opposite me. I tell you that it was love at the first sight," I smiled at my granddaughter who by then showed signs of sleep. I carried her to the bedroom where her mother and father slept. I married 'Rajatha' ,the reigning queen of Tamil Cinema of the 70’s on 19th September ,1981 . The very next year she gave birth to a beautiful baby girl. The birth of the new born showered much more luck upon me and I reached a zenith of my career in the next 5 years with every movie being a hit. During that decade I won several accolades and many filmfares and National awards. Rajatha and I lived happily along with our daughter Hema. It would be foolish, infact too foolish to say that I never loved my family. I looked after them and Rajatha stopped doing films after Hema was born. She transformed herself into a perfect housewife taking care of me and our daughter. Inks - fiction, murder, superstar, tamil. Nice start :) It gives a personalized touch to the story. Flow of the story is great plus i love the dialogues. Anxiously waiting for part 2.
nice one... waiting for more! Mombai Magic - India steamed on your plate!